Yesterday was Molly's 6th birthday. Normally I would have posted on her birthday but when I realized I hadn't yet I figured I could just wait until after her party today. Makes it a little easier for me anyway. She seemed to have a good birthday. She took treats to share with her kindergarten class. I let her pick out the treats and she picked some crackers and cheese packets. She loves those. I was surprised when she picked them out though. I thought she would pick something like Ring Pops. If I had thought of it, I would have taken a picture of her coming out of the school with her birthday hat on. But I didn't. 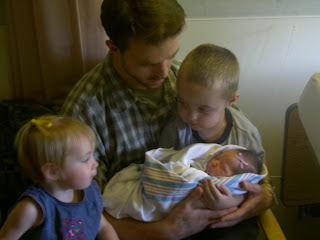 Here is a picture of Molly the day she was born with Emma, Russ and Jimmy. She had a lot of black hair. Here's Molly when she was close to a year old with her cousins Maddy and Rebecca. Rebecca is a week older than Molly and Maddy is a month younger. I can see Dylan in Molly here. We had Molly's party at the local Arctic Circle. I'm sure the workers were probably glad when we left because of the noise level during the party. The kids all seemed to have a good time playing. Molly, of course, was anxious to open her presents. She was ready to go home as soon as her presents were open. Didn't even care that we hadn't had cake yet. One nice thing about having it at Arctic Circle was how they bring you the little complimentary dipped ice cream cones. Almost didn't need the cake after having those. Emma gave herself the job of watching Dylan on the play equipment. He thought he was big enough to play with all of the kids on it. Here she is holding him on one of the slides. It didn't really feel as hot as it can get in the play room there, but as you can see here, it didn't stop Molly from getting quite flushed and a bit sweaty. Could be that she chose to wear her new long-sleeved shirt. Or I would think that if the other kids didn't seem to get juts as hot and sweaty playing. The rest of the pictures are just random pictures from the party.